When I was a kid, I didn’t get grounded. That is not to say that I never got in trouble, I just never got grounded. My punishment for misbehaving when I was young… polishing silver. Sit at the kitchen table and polish the tea server, or the silverware, or the serving trays. ALL with the I-can-never-get-it-out-of-my-memory blue Amway silver polish. When I was done, I could go play. I was a bit of a smartass, so I polished a lot of silver. As an adult, all of the silver I inherited (some of the same stuff I had to polish as a kid) is packed up in a closet because I really have no use of it at the moment. So I haven’t had the need to bust out the silver polish in years and years. That is until last month. Last month my family and I had to move my Nana into a nursing home and it led to us cleaning out her condo and getting rid of everything. Or well, giving a lot to Goodwill, putting some valuables in the safety deposit box and setting aside a lot of things for an eventual estate sale in the future. The plan to have an eventual estate sale is how I ended up carting three and a half boxes of tarnished silver piece back to my place, where they sat in my dining room for two weeks while I stared at them in dread, thinking of the memory of that stupid blue polish. 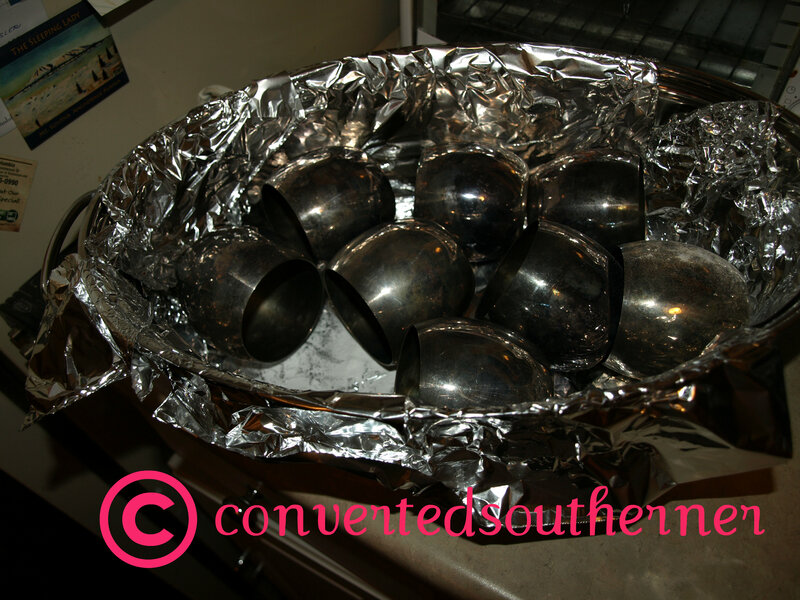 I am talking silver that has been packed up and not used in twenty years or so… punch bowl set, candy dishes, trays, silverware… you name it, my Nana had it and it was incredibly tarnished, I mean black in places. Needless to say, I was dreading the thought of having to polish it all! Enter the internet. I knew there had to be another way to clean it. I had remembered learning something that involved tin foil to clean it, but I hadn’t touched silver in so long I had forgotten what it was. So I Googled it and had my answer… tin foil, baking soda, boiling water. Best invention ever! Step one- Line a big container with tin foil. I used a roasting pan. Leave it for 10 minutes or so, and like magic, all the tarnish is off the silver! Seriously, I got done in an hour or so what would have taken several days before. I then used a soft cloth and some Tarnex to give it some shine, and presto! Polished silver! Words cannot describe how much I was dreading this project and how happy I was to have it done and sent off to my father’s house. 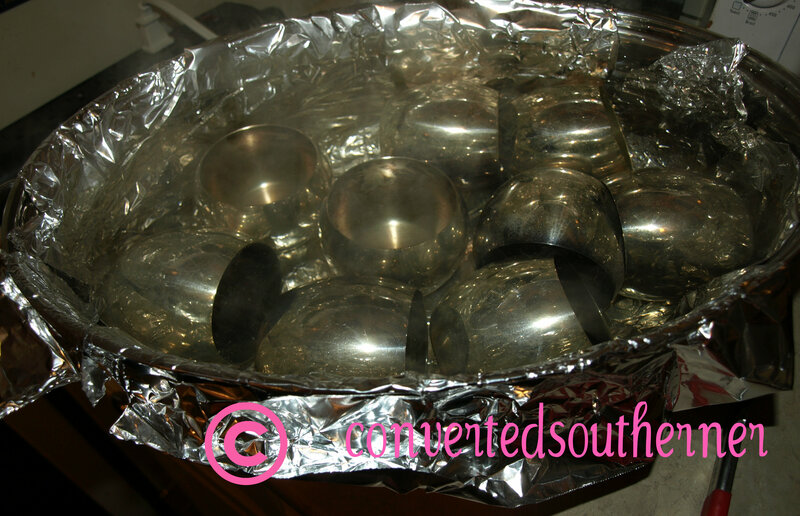 So, the next time you need to polish a silver tea set, be sure the pull out the tin foil and baking soda. And that is my house cleaning tip for 2012! And the after, or the in process… you can see the steam coming off the water still!